This is a Turn Key Solution. Electric To Spec and Plumbing. The HyperponicTM Grow Solution contains a number of components to facilitate the cloning, planting, growth, harvest, cleaning and re-planting. This information below will give you a glimpse into what does into the solution. Our clone racks are up to 3 levels of hydroponic clones, managed by an automated light and pump system to facilitate quick growth. The clones are grown in our grow medium, shaped for their next steps so there is a seamless and easy transfer to the CropTowers©. 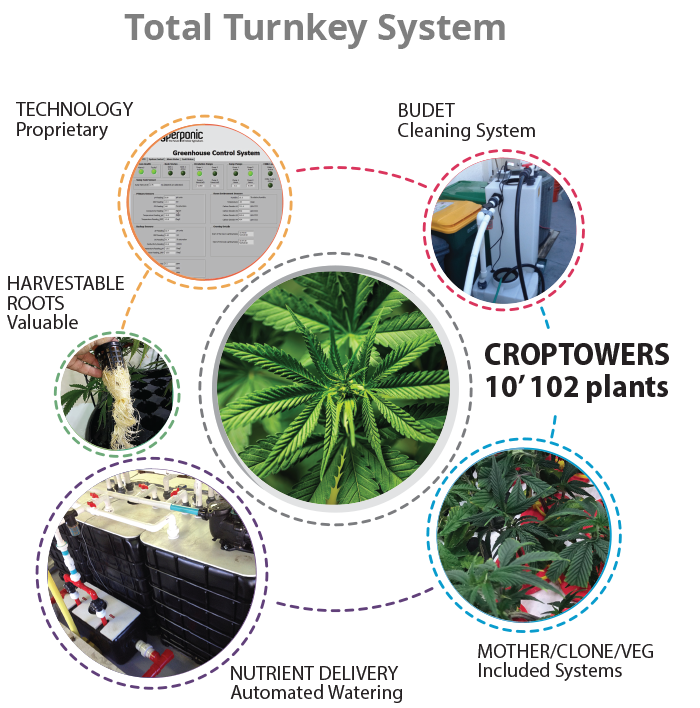 The CropTowers© are part of the aeroponic, virtually automated, grow system, that manages all aspects of the grow, veg, scrog and harvest phases. Each 10-foot tall CropTowers holds 102 plants in 81 square feet of floor space. The plant roots grow inside the tower, in no grow medium (hence aeroponic). The system feeds the roots on a consistent basis during each phase of the grow cycle. Since the canopy is measured from the plant stem at the roots, our canopies produce far more product in a smaller space than anything you are doing now. We use very high quality, American made LED lights, 8 feet tall and 36 feet around, encircling the tower and the plants to provide the exact level of light, at the right times to each and every plant, no matter the plants' place in the growth cycle. Three fully operational nutrient tanks hold the proprietary blend to feed the plants in the CropTowers©. They are computer managed and monitored to deliver a consistent supply of needed nutrition to the plant roots. Redundancy is built into everything we do, and there are always standby systems in place in case an alternative tank needs to kick into action. After the plants are harvested, our patent-pending Budet© cleaning machine is attached to the tower and within a few hours the tower is cleaned, sterilized, dried and ready for the next planting of clones. A short turnaround adds to the speed at which your grow can be productive and profitable. We monitor and manage the air quality in terms of O2, CO2, humidity, temperature and other elements to ensure the perfect environment for the plants to thrive. Our proprietary computer management systems monitors and manages every key aspect of each tower. Air, nutrition, temperature, lights, CO2, everything that affects plant grows and quality is continuously monitored, measured and managed to ensure optimum outcomes. All data is captured and posted to our cloud-based computer network, so every aspect of every grow and every tower can be meticulously managed on a 24/7 basis. Fully redundant backup systems can be brought into action at a moment's notice to ensure there is ZERO downtime during the growth cycle.